“Why is RockMelt asking for these permissions? “How does chat work with messages? Will RockMelt automatically update my Facebook status or spam my friends’ walls? No. RockMelt will never post new status updates on your wall or your friends’ walls without your permission. The only status updates RockMelt posts are the ones you post yourself using RockMelt’s Share button and sharing features. 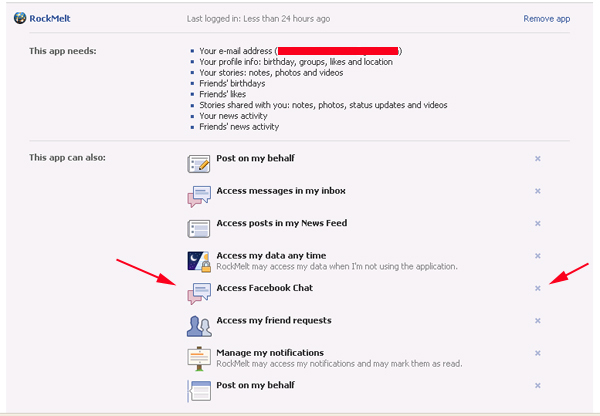 The “Post to my Wall” permission RockMelt asks for when you sign in is better understood as a “Use RockMelt to post to my Wall” permission, and is needed to let you share on your own wall from RockMelt. The messages/chats being circulated are not spam, and they are definitely not a virus. Users of the Rockmelt browser are choosing to invite their friends when they install the browser.